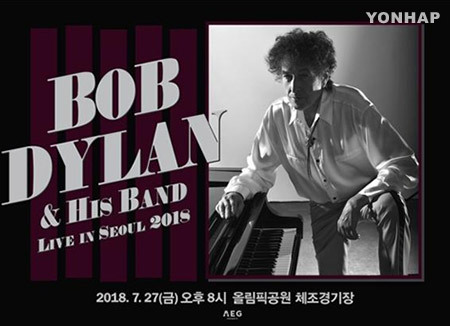 American folk music legend Bop Dylan will visit South Korea this week. According to local entertainment agency Papas E&M, the 77-year-old singer-songwriter will arrive in Seoul early Thursday on a chartered plane from the U.S. He is scheduled to hold a concert at the Olympic Gymnastics Arena in southeastern Seoul on Friday night. It will be Dylan's second performance in the country following his maiden concert in 2010. His appearance will also mark the first time locals will get to see him since he received the Nobel Literature award in 2016. Event organizers said no jumbo screens will be installed at the concert venue and no fan meetings will be held during his latest visit.